Radio-controlled cars are always of interest to almost everyone. 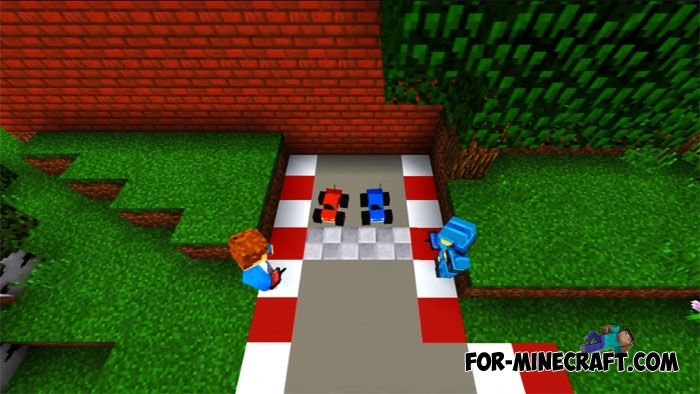 These smaller copies of cars are able to drive quite quickly, climb to small slides, drift and jump, it all depends on the purpose. 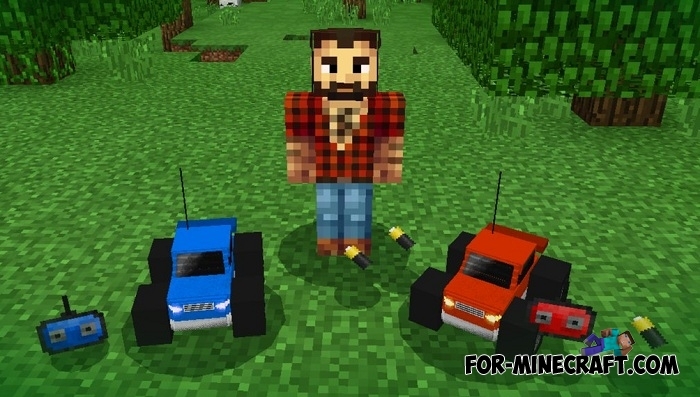 If you would like to get such a car in Minecraft Pocket Edition then download this addon. New sounds for cars and batteries. You need to replace the batteries every 5 minutes. Support for Minecraft Pocket Edition (Bedrock) 1.2.6. 1) Ability to play this addon with friends. 2) No bugs and crashes of the game. 3) Very simple installation taking one minute. 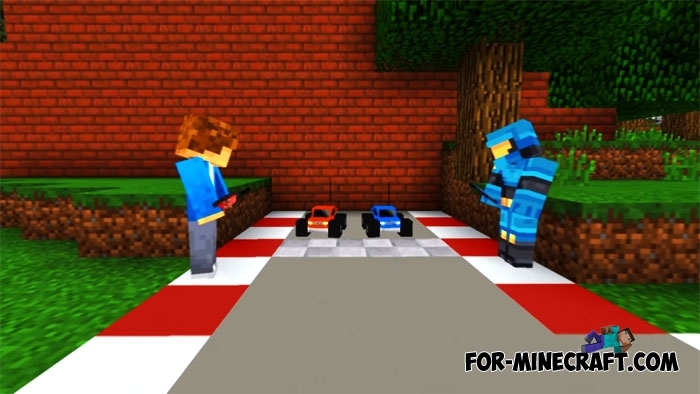 The RC Car addon is designed so that cars have a lot of similarities to real life. You have to charge your cars and use a radio controller, but not everything as you think. First, radio-controlled cars will go only if you tap on the surface. Perhaps this is the most correct way to implement this addon, because only Minecraft mods allow you to change many other parameters and add new GUI, and addons is a simplified version of the modifications. 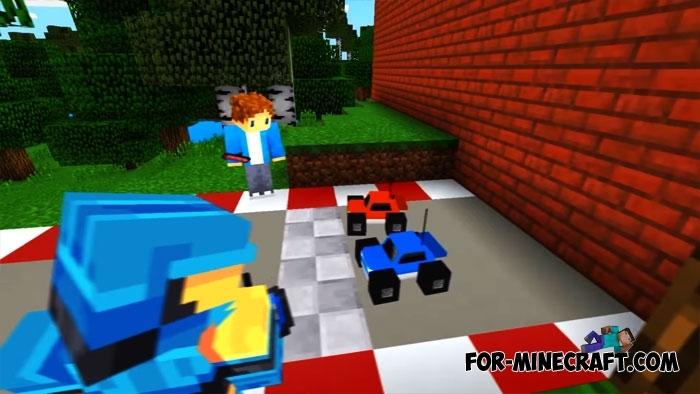 Secondly, you need spawn eggs and a certain object (stray for red car and wither skeleton for blue one) so that your radio-controlled car starts to drive. It will not be easy to use this addon in survival, so turn on the creative mode from the very beginning. Spawn one of the mobs and throw the intended eggs for driving. 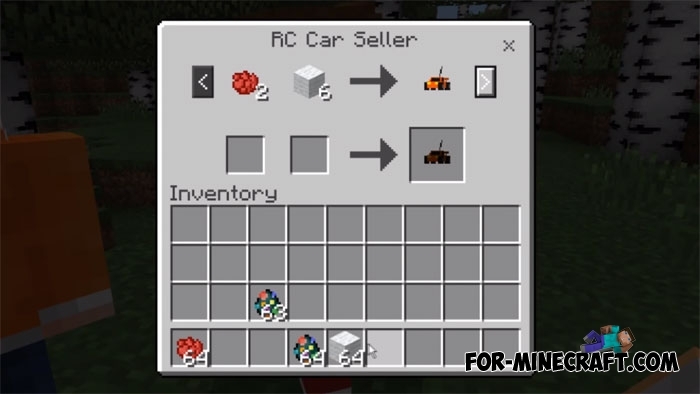 Thirdly, the car needs charging, take batteries in the inventory (icons are replaced) and tap on the car. After some time, the car discharges and stops driving. The creator of the addon recorded a video where he showed how to use the addon. Watch it and you will quickly understand how to properly operate radio-controlled cars. How to install the RC Car addon? Download the addon and open it using the game. All the addon files will be installed automatically, you only need to activate the files in the game or world settings.